September 20, 2016 By Elizabeth Lindemann 18 Comments / This post may contain affiliate links. I’m fairly certain the title of this post leaves little to the imagination about this “mysterious” BIG, HUGE announcement. So without further ado, I’m so, so happy to announce that my husband Zach and I are expecting a little baby girl in January!! LOOK at that little nose. LOOK at that little arm! LOOK at her belly!!! Ahhhhhhh! The cuteness! I’ve been dying to tell y’all. First of all: because it’s SO EXCITING! 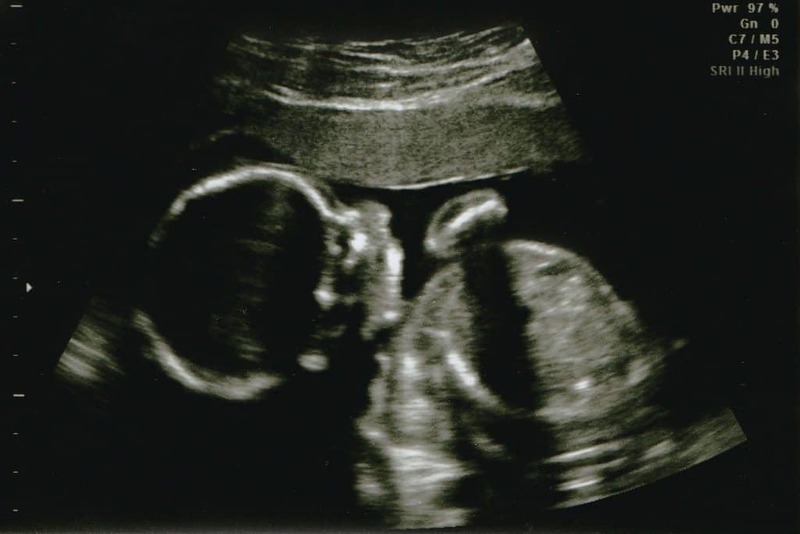 Second of all: because being pregnant has created some interesting situations with food blogging. I haven’t had many food cravings (although the other day, I woke up NEEDING a brownie in the worst way, so I made a brownie in a mug– a dangerous game indeed). Rather, I’ve had tons of food aversions, especially when I was in the first trimester. It’s all a bit fuzzy, but I spent most of June and July on the couch hating any and all food. I know… right? ME? Hate food?! 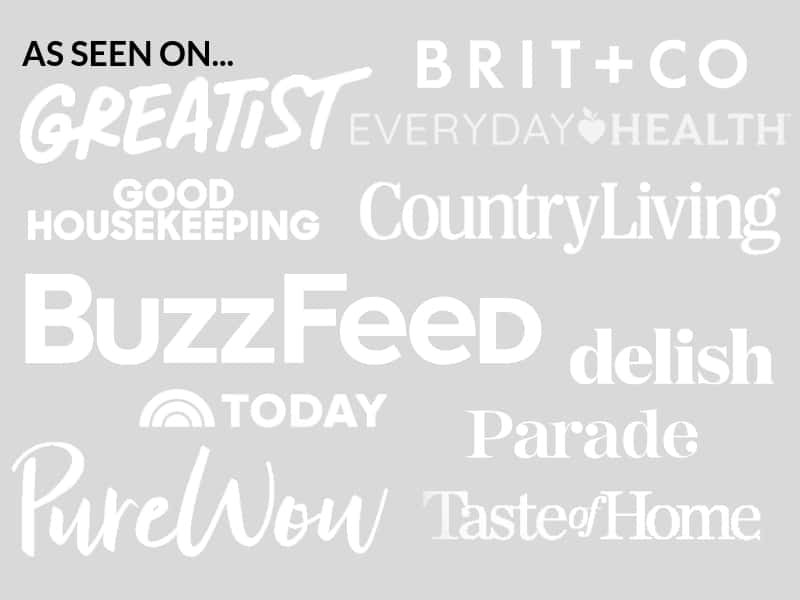 This was especially difficult as I had just quit my full-time teaching job in order to become a full-time food blogger who all of a sudden HATED food (and yes, this was part of the plan… I’m so excited to be able to work from home with a flexible schedule so I can stay home with my little girl!). I went through about a month and a half of despising chicken in all forms (thankfully, that’s over). I still won’t go near garlic (what?!) and I don’t like spicy foods (SERIOUSLY?!). Pre-pregnancy Elizabeth would have scoffed at my delicate palate and newly developed love for Annie’s boxed macaroni and cheese, but pregnancy will do some really weird things to you. REALLY weird things. And you thought the ultrasound picture was adorable! This is your typical, delicious, sugar-filled white cake with buttercream frosting… but with a twist. It’s filled with pink chocolate covered candies (similar to M and Ms) to reveal the gender of our little baby. No “real” food here, folks. Not for this special occasion! The cake was actually very easy to put together. I put together a step by step photo tutorial for y’all. Here it is! The instructions are written out in the recipe card below, and the image is there as well so if you print it, it should show up. This isn’t a recipe for the cake or the frosting- just the tutorial. I used the Cook’s Illustrated’s white cake recipe, which makes two layers and came out absolutely perfect. It has both vanilla and almond extract in it, giving it an extra sweet richness. If you choose a cake with three layers, just adjust it so you cut a hole in the bottom two layers, rather than just the one bottom layer. I made vanilla almond buttercream frosting. 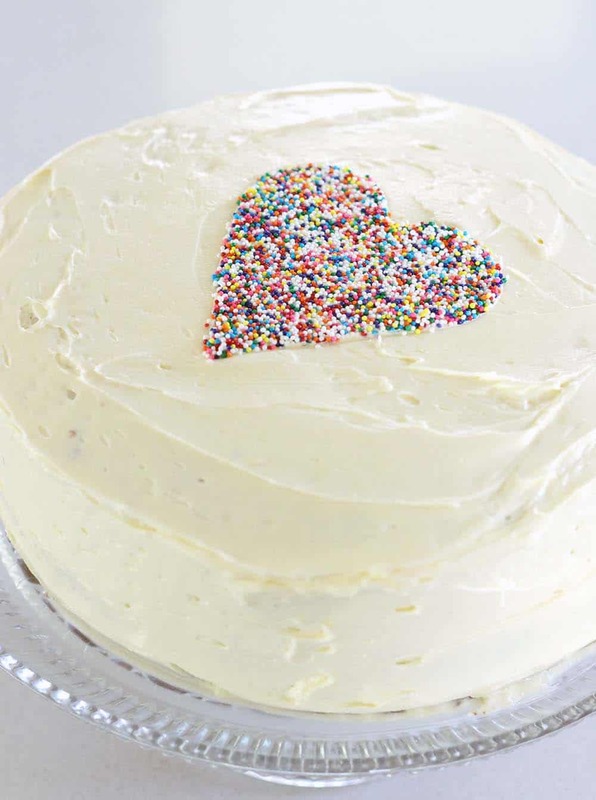 I wanted as white of a cake and frosting as possible so the color of the M and Ms and the sprinkle heart would stand out, but you can use whatever kind of cake and frosting you like. I won’t judge you if you use a boxed mix, either. One final thing- when cutting into the cake, make sure you have your camera ready, someone taking a video, and instruct the cutter(s) to make a large wedge, so it’s easy for everyone to see the candy on the inside. So there you have it! Phew, it feels good to get that off my chest. Now if you’ll excuse me, this baby wants some of the leftover cake that’s lingering in our fridge and I’m not about to deny her it. I love her too much. 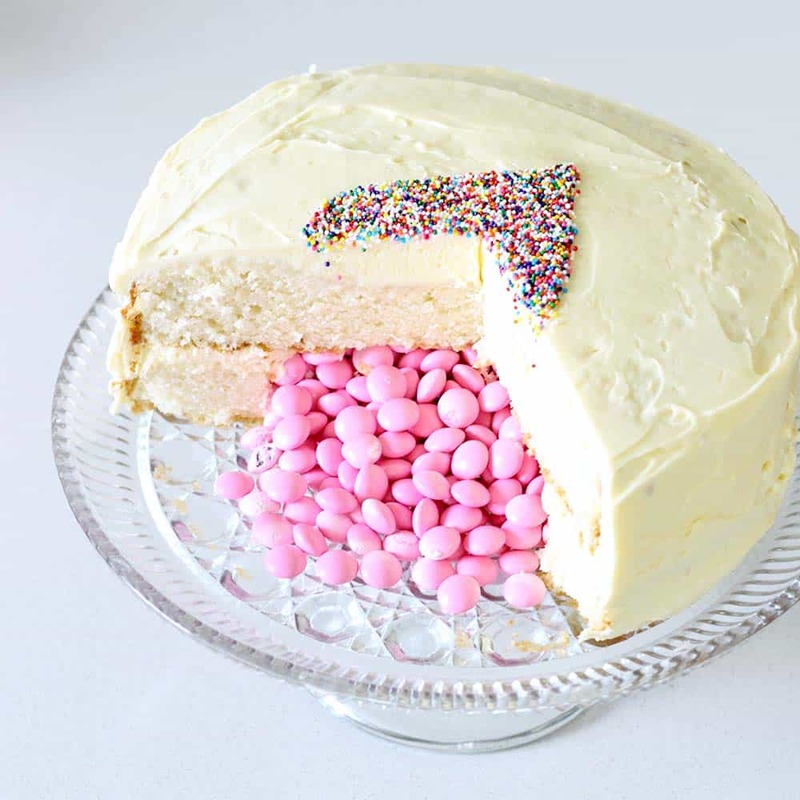 A step by step tutorial for an adorable, pink (or blue) M and M chocolate candy filled white cake with a sprinkle heart that reveals the baby's gender! Flatten one of the layers of cake on the top so it's even by using a large serrated knife. Lay thin pieces of parchment paper along the outside of a cake stand or platter, where the edges of the cake will be. Place the flattened out later on top of the cake stand and make sure the parchment paper is under the outside of all of it. 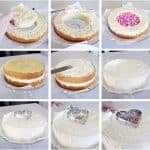 Cut a hole in the center of the cake using a stencil (such as a cookie cutter or tupperware lid). Frost the remaining top surface of the cake around where the hole was cut out. Place the top layer on the cake. Frost the top and sides of the cake so no cake is showing. 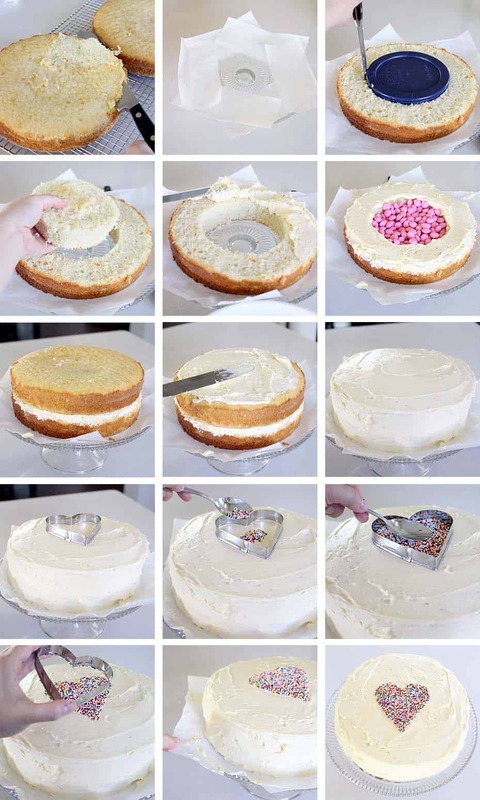 Place a heart shaped cookie cutter in the center of the cake. Spoon non-pareil rainbow sprinkles in the center of the heart and spread out with a spoon. Press down gently with the spoon so they stick better. Carefully remove the cookie cutter. Carefully remove the pieces of parchment paper from under the cake. Wait patiently for your guests to arrive. 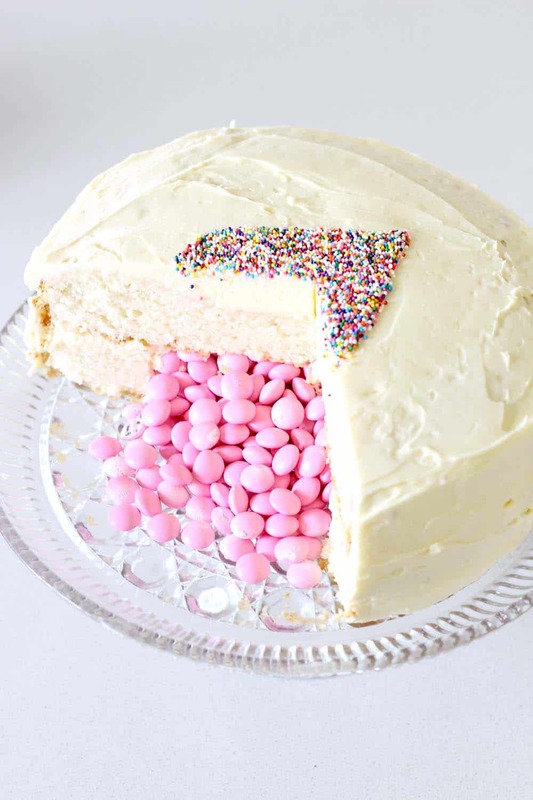 When cutting into the cake, I recommend cutting a big wedge (as pictured) so it's easy to see the candies spill out of the center of the cake. * You can use a three layer cake for this as well- just cut a hole in both of the bottom layers and adjust accordingly! Congratulations Elizabeth and Zach! Your little girl is so lucky to have such wonderful parents! Thanks, Elizabeth :-) We miss you! Great idea! It’s fun to make for regular occasions and not just gender reveal parties and you can fill it with whatever you want. I just got a chance to read all of this post…and I cried when I saw the look on your mom’s face! Thank you for posting the pictures of the big reveal. I am so happy for all of you and cannot wait to see her when you welcome her into the world!! Aw… thanks so much! Can’t wait for you to meet her when you come visit! Yay! A baby girl! Congratulations to all the family, Mom, Dad, Grands, Aunts, and Uncles. And what a great way to announce it. I just saw something online about unusual ways to announce an impending birth, but yours takes the cake! LOL! Take care of yourself and your baby. Concentrate on that. We’ll miss you but know you’re busy making a baby. Hey, you could lie on the couch and catch up on that correspondence you were mentioning a few months back . . . Thanks so much Barbara! Takes the cake… good one :-) And don’t worry- I’m not going anywhere! I’m planning on continuing to post at least once a week (and hoping I can write some posts in advance for when the baby comes). Since I’m feeling much better in the second trimester it’s been much easier for me to work on the blog (although I will admit, the couch and I are still great friends). Thank you for sharing your wonderful news and also for the awesome recipes that pop up in my email, I look forward to seeing them! Congratulations! Amazing news! I’m sure she’ll be happy to have a mom that is an awesome cook! Congratulations – SO happy for you!! !